The highly combative and seemingly unprepared Matt Whitaker fought today with the House Judiciary Committee during the hearing. This clown couldn’t or wouldn’t answer simple yes-no questions. His canned and time-wasting answers turned into a shouting match during several occasions as the hearing dragged on. One point of particular note was when a Democratic lawmaker brought up a mystery million dollar payoff he received from a conservative non-profit which refuses to reveal its donors. 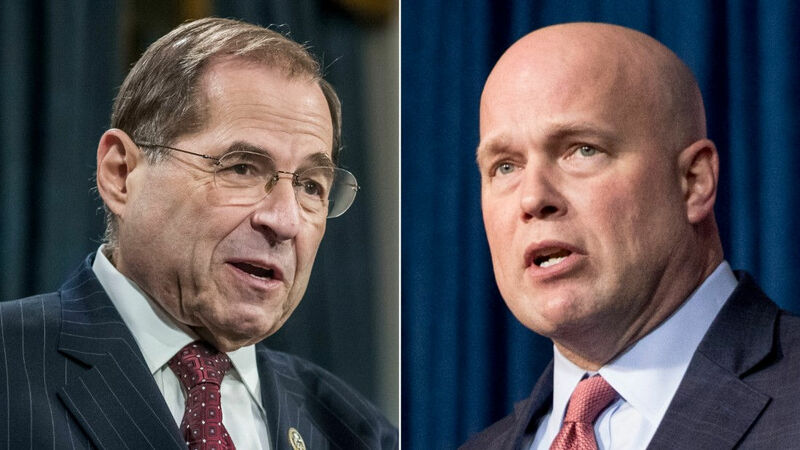 As he has done all day, Trump flunky and defender Doug Collins (R-GA) jumped in with another “so-called” point of order, which he did numerous times during the hearing running interference for Whitaker, with the parliamentary move easily swatted away by Chairman Jerry Nadler (R-NY). This entry was posted in Trump chump and tagged Corruption, Crime, Cronyism, Traitor Trump, Trump chump, Tyrant Trump. Bookmark the permalink. ← The Real State of the Union………………….The United States in decline. A failure? I thought he succeeded. His audience was Trump’s base. A failure? We said Flail. I call him Daddy Warbucks. And you call him Cranial Occupant. Actually, Ivanka calls him Big Daddy, or Bigly Daddy, or Bigoted Daddy, or Big Fat Fascist Fool With An Empty Bloated Tangerine For A Head Daddy.